His teammates helped him out, especially reliever Luke Gregerson and centerfielder Scott Hairston, but what really mattered was that Shawn Hill garnered his first victory of 2009 late last night against The San Francisco Giants. 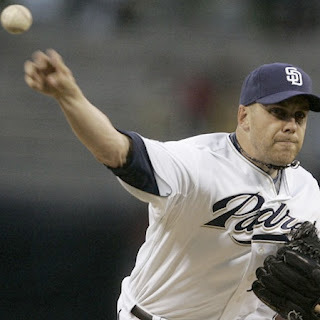 Pitching into the sixth inning at Petco Park, the now jersey number 34 wearing former Washington Pitcher got into some serious trouble during that frame, allowing his second run of the evening while loading up the bases with no outs. Relieved by Padres Manager Bud Black, Gregerson trotted out to induce a key 3-6-3 double play and strike out to end the rally. Later Hairston would help seal the victory for Hill when he leaped onto the centerfield wall to rob The Giants Bengie Molina of a sure rbi extra base hit in the top of the 8th and followed that up with a three run homer in the bottom half. Until he tired in the 6th, Shawn Hill looked good. His sinker was working and he was effectively moving through The San Francisco Giants lineup--something not seen by Our Washington Nationals starters during the first four games of 2009. Who would have believed that Shawn Hill would receive the first win in The Major Leagues during the regular season of any pitcher in Nationals Spring Training Camp? And he doesn't play for us anymore. Good For Shawn Hill. We are very happy for him. Sohna and I watched portions of his game on DirecTV's MLB Extra Innings Package. On Shawn Hill - I figured the Nats made a mistake letting him go. The first week's results confirm that. Why give away a good pitcher when most of the rest of your staff is mediocre or unproven? And Bonifacio, too. Count on our front office to get it wrong -- each and every time! On the statues - The Josh Gibson one looks neat, because the swinging bat behind him doesn't obscure his face and body. The Frank Howard and Walter Johnson ones "are horrendous" in the words of my artist son. Both should be scrapped and re-done. Is there some kind of curse on Washington baseball that makes everyone ruin what should be simple? Baseball chooses a carnival barker instead of a professional as the Nats' GM. Mayor Williams unnecessarily puts the stadium lease to a council vote, nearly ruining the deal and causing fans to get a "design to cost" run-of-the-mill stadium that could be anywhere, nothing distinctively D.C. about it. The Nats choose a minor league "emcee" like Clint and cheesy between inning stunts that make the whole product seem minor league. Our team is clearly baseball's worst -- worst performing, worst marketed, worst covered in the nation. Now, they can't even get something as simple as statues right! What an unmitigated disaster and tragedy baseball in Washington has become. Now, in addition to jokes about our team and half-empty stadium (the Nats may not even draw 1 million fans this year), we have to watch opposing teams' fans mock and jeer the statues of what few baseball heroes we can claim. It is so FRUSTRATING I could scream! ALL of 2005's wonderful beginning has been utterly, totally ruined! Shawn Hill's release was an unnecessarily disastrous move by the front office. What, exactly, was the risk in giving him one more chance? And the timing of his release -- letting him go at $125K instead of his $750K salary -- seems awfully suspect. I'll wait until I see the statues in person before I make a final judgement, but I don't mind the in-motion look of the statues. I look forward to seeing them close-up on Opening Day. Good for Hill. I'm rooting for him.